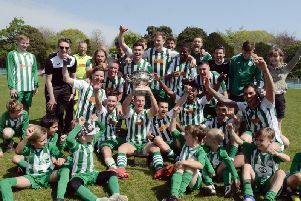 Rustington ran out 3-0 winners against 10-man Littlehampton United to bounce back from last week's semi-final defeat to Upper Beeding. Josh Irish scored all three goals to make this season's tally an impressive 34 goals. Manager Kerry Hardwell said: "It was a must that we responded in a positive manner with three points that took us back to the top of the league. "With conditions not being great the first 20 minutes wasn’t the best of displays but after adapting to them we finally got going however on 20 minutes the game changed after Littlehampton United forward Tom Foxon was sent off." Foxon was sent off for an off the ball incident following a scuffle. Rustington finally got on the scoresheet from the spot on 31 minutes after Chris Darwin was mauled down in the box. Irish Irish fired home from the spot. On 41 minutes a mix up at the by the home keeper allowed Irish to get his second, touching it home on the goal line. Then on 45 minutes a great team goal allowed Irish to get his hat-trick. Hardwell added: "The second half was pretty much played at a slow pace and we should of scored three or four more however great saves and the woodwork kept the score line at 3-0." John Lawson, assistant manager of Littlehampton United said: "We should’ve scored first, a good opportunity at the back post was missed, Only when Darwin went down in the box did they have their first opportunity." Next up for Rustington is an away trip to Bosham. Rustington: Billy Nash, John Beaney, Mike Gilchrist, Alex Maciver, Oli Chick, Jack Anderton, Dec Jenkins, Krzysztof Paraficz, Steve Kirkham, Josh Irish, Chris Darwin. Subs: Tom Ryder, Carl Bennett, Kerry Hardwell.